Autism: What Goes On In That Beautiful Mind? Hearing your child has Autism is so unbelievably scary. Maybe you thought for a while there could be something not quite right? Or maybe you were completely oblivious to all the signs. It doesn’t really matter how you were on that day your child was diagnosed. In one short little moment, in that doctors office life changed. Life changed for the good not bad. Yes, it wasn’t going to be easy at all. The journey was going to be one big emotional roller coaster, but it was your child’s journey, and you were going to be on with them for the rest of forever. All you wanted to know was how to help your child feel safe, loved and care for them in a way they needed. On the other hand you hoped for soccer practice and play dates. At least this is how I felt. When each one of my children were born, I thought how many amazing things this child is going to do in their life. They were beautiful, and they would bless my life. I still believe this! We have two beautiful and amazing children. At age 2 our son, Ian was diagnosed with severe, non-verbal classic Autism. It was a scary and a hard time. Today, I look back and think what a blessing to have had him diagnosed. Now we can know how to help him, or to teach him and how to care for him. He has blessed our lives forever. I love to sit and watch Ian and wonder “What goes on in that beautiful mind of his” ? It’s amazing the things he is observant about. Things that really don’t make since to you and I, or we would never even notice, or think of. It’s amazing how our Ian, who is a nonverbal almost 7 year old with autism’s mind works. He has a beautiful mind and is amazingly smart! If only I could get inside his head just for a few hours. I’m pretty sure that is all I could handle. My simple mind would not be able wrap it self around the way his mind works. If I was able to though, I could know how to teach him, to communicate with him and so forth. Of course this wont happen, and so we take trials and watch him to learn more about him. Ian has taught me things that I could have never learned any other way. He has taught me to be patient as his mother. To give him that time to process my questions or requests, and then he can answer you. Sometimes in life we get so busy we need an answer now! Why do we do this to others? If we give them that time to process, they can know the correct answer or how they feel about it. Ian knows how to respond in his own way if I just give him that time to process. He has taught me to not miss the little things in life. The little things mean the most. Things such as saying hello to a stranger in the store. This could make their day, when you had no idea they were struggling. Even though Ian often does not respond back to us when we say hello, or goodbye, he is listening. He could be having a hard day inside, and a simple hello could put a sweet little smile on his face. One day we were in the grocery store, and the girl that was bagging our groceries was so loving towards Ian. I’m usually in such a rush to go in and out of the store when I have him with me. If I have him happy and doing well, I need to hurry get my stuff before that all changes. As I was paying for my groceries, this girl got down to Ian’s level and said hello to him. He didn’t respond back but smiled. Like I always say, “oh, he is non-verbal. 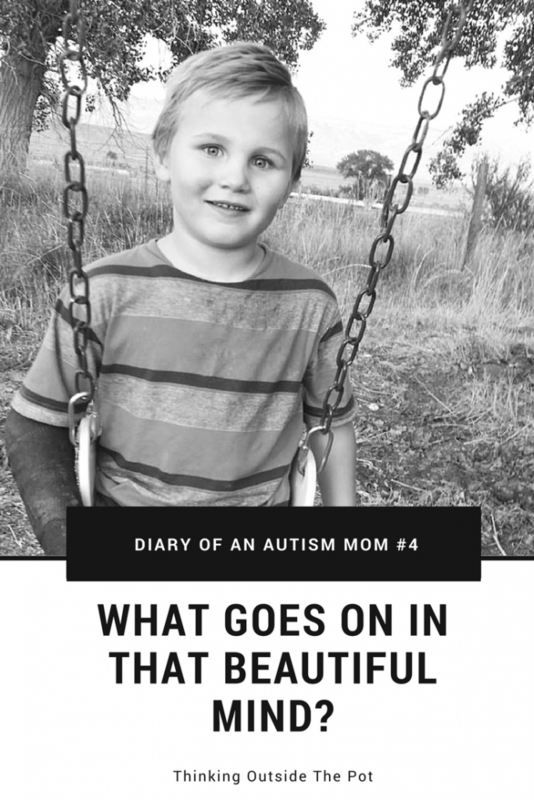 The girl said, “I know, he has autism right?” I said, “yes he does.” She then told me, “He deserves to have someone say hello to him still.” I thanked her for the kindness she showed to my son that day and went on our way. Your child with Autism may not be on the journey you dreamed for them.That child is on a different journey. A journey that will have so many challenges, but so many more accomplishments. They will teach you lessons you never thought you needed. You will sit and wonder, “what goes on in that beautiful mind?, how do I help them reach their highest potential? You will know because they will teach you. You have been blessed with the most precious gift anyone could give you. A child who is beautifully smart.